A common question that we get when designing site plans and evaluating sites with our clients is “Are there any regulations on which trees I must keep, and which I can remove on my site?” The short answer is probably. This issue really depends on which jurisdiction your property is located and under what zoning ordinance it must abide. For the sake of this article, we will explain the requirements in one of the more stringent jurisdictions…Austin, TX. Which trees on my site are protected? The first step is always to ask the jurisdiction what sizes and species of trees are protected. Most jurisdictions with tree protection ordinances will determine the trees protection level according to species and size of the tree. We will go through the types that are protected from removal in Austin, TX. There are 4 types of trees according to the City of Austin. Protected Trees – A protected tree is any tree (regardless of species) that is 19” or larger in diameter. Trees that Require Mitigation – Any tree that is 8” (regardless of species) or larger in diameter must be mitigated if removed. What all are the trees protected from? The main requirement to pay attention to here is the damaging of the root system. 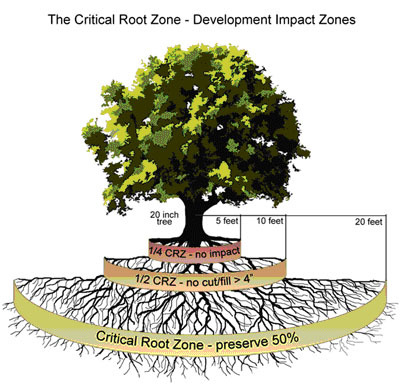 Any construction within the “Critical root zone” or CRZ will damage the tree. The CRZ is defined by the size of the tree’s trunk. It is one foot for every 1” of the tree’s diameter. For instance, if the tree is 20” wide than the CRZ is 20 feet total from the trunk of the tree. The diagram below outlines how close you can get before you are damaging the root system, and therefore removing the tree. This can be a huge part of site planning as the design team will have coordinate where not only the building, but any paving can be placed in relation to the trees. As the diagram shows, within the first ¼ of the CRZ there can be no impact at all. Within the first ½ of the CRZ there can be no digging more than 4” down. Within the outer ½ of the CRZ you must preserve at least 50% of the outer ring of CRZ for the tree not to be damaged. What if the Tree must be removed? If any tree 8” in diameter or larger must be removed for any reason (at least in the City of Austin) there are some things that you can do depending on the type of tree as listed above. The City Arborist will come inspect the conditions. It is rare to get a variance to remove a heritage tree for any other reason than the above. Mitigated Tree Removal – If you want to remove a tree 8” or larger, that is not a protected or heritage tree, all you have to do is mark its removal on the site plan. The City of Austin may require (depending on your site) that you mitigate any trees removed. This includes replanting a tree in place of the tree to be removed. You may be required to put down a deposit at the time of the approved site plan to ensure that the trees get planted. If you are looking to purchase a property for development, the best way to determine that it is feasible for your use, any protected trees on the site can be designed around, and the property is ultimately a good fit for your development, is to consult a design professional that is well versed in the local requirements. Great and useful information about tree removal in Austin- thanks! Also, helpful diagram showing why critical root zone is important- many thanks!